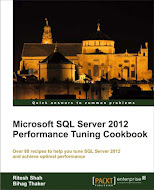 I have already explained different ways to find TCP port of SQL Server in one of my earlier article. We have already seen following different ways to find TCP port. These are the traditional ways which has been in use since long but SQL Server 2012 provides you one direct way by providing “sys.dm_tcp_listener_states” DMV. Let us try executing simple SELECT statement on “sys.dm_tcp_listener_states” DMV. Here is the screen capture I have received from my laptop when I executed above SELECT statement. This entry was posted in sql server, sys.dm_tcp_listener_states, TCPIP and tagged sys.dm_tcp_listener_states, TCP, TCPIP Port on February 16, 2013 by Riteshshah.